7. Glutamatergic signaling: what questions still remain? Most rapid excitatory synaptic signaling is mediated by glutamatergic neurotransmission. An important challenge in neurobiology is to understand the molecular architecture of functional glutamatergic synapses. By combining the techniques of genetics, molecular biology and electrophysiology in C. elegans we have the potential to identify and characterize the molecules that contribute to the function of glutamatergic synapses. In C. elegans both excitatory and inhibitory ionotropic glutamate receptors are linked to neural circuits and behavior. Genetic analysis has identified genes required for receptor expression, trafficking, localization, stabilization and function at synapses. Significantly, novel proteins required for glutamate receptor function have been discovered in the worm. These advances may also lead to a better understanding of glutamatergic signaling in vertebrates. Ionotropic glutamate receptors (iGluRs) are a major class of heteromeric ligand-gated ion channels and mediate the majority of the excitatory neurotransmission in the vertebrate central nervous system (CNS). Following the cloning of the first subunit from rat in 1989 (Hollmann et al., 1989), a large family of iGluR subunits was discovered. These transmembrane proteins can be crudely classified on the basis of pharmacological specificity as belonging to the N-methyl-D-aspartate (NMDA) class or the non-NMDA class. The molecular cloning of receptor subunits revealed that classes defined by molecular criteria were the same as those defined earlier by pharmacological criteria (Hollmann and Heinemann, 1994; Dingledine et al., 1999). Of the eighteen receptor subunits identified in rat, 7 belong to the NMDA class (NR1, NR2A-D, NR3A-B). The remaining subunits are members of the non-NMDA class, which can be further subdivided into those preferentially gated by the drugs α-amino-3-hydroxy-5-methyl-4-isoxazole propionic acid (AMPA; GluR1-4/GluRA-D), or kainate (KA; GluR5-7, KA1-2). Two other subunits, δ1 and δ2, which share high sequence similarity with other iGluR subunits, are termed orphan receptors because there is no evidence that they form functional glutamate-gated receptors. A functional ligand-gated receptor is formed by the heteromeric assembly of four subunits from a single class, e.g., AMPA subunits assemble with other members of the AMPA subfamily (Laube et al., 1998; Mano and Teichberg, 1998; Rosenmund et al., 1998). At least 10 putative iGluR subunits are expressed in C. elegans (Brockie et al., 2001a; Brockie and Maricq, 2003). Members of the non-NMDA class (GLR-1 - GLR-8) include subunits most similar to either the AMPA or kainate subfamilies. The 2 NMDA subunits, NMR-1 and NMR-2, belong to the NR1 and NR2A subfamilies, respectively (Figure 1). The large number of receptor subunits identified in C. elegans suggests that the worm has the potential to express a diverse number of functional iGluRs. The amino acid sequence of C. elegans subunits reveals many similarities between C. elegans and vertebrate iGluR subunits (Brockie et al., 2001a). Regions that encode the extracellular ligand binding domains, S1 and S2, the 4 hydrophobic domains, TM1-TM3 and the pore region, are conserved in C. elegans. Amino acid residues that influence the properties of vertebrate iGluRs are also present in C. elegans subunits, including the "Q/R" site of non-NMDA receptors (Seeburg et al., 1998) and a conserved asparagine (N) residue in NMDA receptors (Burnashev et al., 1992b) that regulate calcium permeability. The iGluR signature SYTANLAA amino acid sequence at the C-terminus of TM2 is also conserved in C. elegans subunits and appears to be important for receptor gating. A point mutation in this region was identified in an iGluR subunit in the mouse mutant strain called lurcher (Zuo et al., 1997). The mutation changed an alanine (A) to threonine (T) in the δ2 subunit that appeared to cause the receptor to remain constitutively open. This same A to T mutation, when introduced into the GLR-1 subunit in a transgenic C. elegans strain, causes a dramatic change in locomotion presumably due to increased ion flow through the receptor channel (Zheng et al., 1999). In addition to the cation selective iGluRs, a small family of glutamate-gated chloride channels (GluCl) has been identified in C. elegans. The inhibitory GluCls form channels that are permeant to chloride ions and are sensitive to the anthelmintic drug avermectin (Cully et al., 1994). The GluCl channels appear unique to invertebrates and members of this family have also been isolated from Drosophila, and the parasitic nematodes Haemonchus contortus, Ascaris suum and Dirofilaria immitis (Cully et al., 1996; Forrester et al., 1999; Jagannathan et al., 1999; Cheeseman et al., 2001; Forrester et al., 2002; Yates and Wolstenholme, 2004). 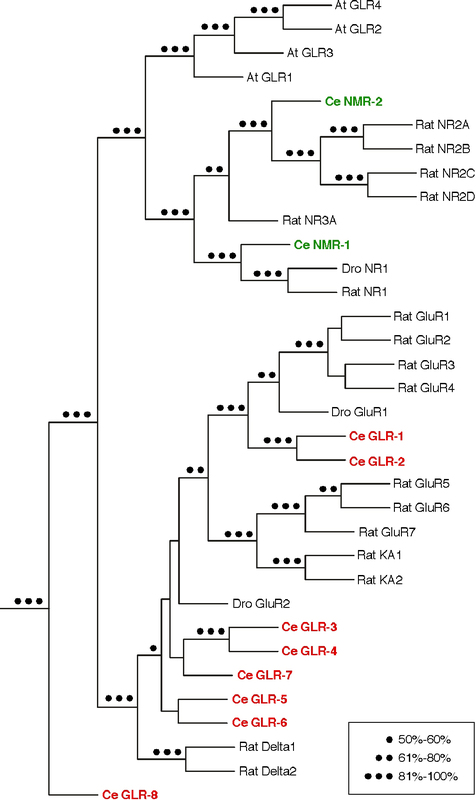 There are at least 6 genes that encode GluCl subunits in C. elegans - glc-1, glc-2, glc-3, glc-4, avr-14/gbr-2 and avr-15 (Cully et al., 1994; Dent et al., 1997; Vassilatis et al., 1997; Laughton et al., 1997a; Dent et al., 2000; Horoszok et al., 2001). Multiple splice variants are encoded by a subset of these genes (avr-14 and avr-15; Dent et al., 1997; Vassilatis et al., 1997; Laughton et al., 1997a) and the subunit membrane topology places them in the ligand-gated ion channel superfamily (LGICS) that includes the excitatory acetylcholine and serotonin receptors and the inhibitory GABA and glycine receptors (Ortells and Lunt, 1995). Figure 1. Ionotropic glutamate receptor subunits. Phylogenetic tree of iGluR subunits from rat, Drosophila (Dro), Arabidopsis (At), and C. elegans (Ce). C. elegans non-NMDA and NMDA subunits are shown in red and green, respectively. The dots represent the values obtained from 500 bootstrap replicates. This figure was modified and reproduced with permission from Brockie et al. (2001a). Copyright © 2001 Society for Neuroscience. The first genes encoding GluCl subunits, glc-1 (GluClα1) and glc-2 (GluClβ), were identified in C. elegans by functional expression in Xenopus oocytes (Cully et al., 1994). GluClα1 and GluClβ associate in oocytes to form a heteromeric glutamate-gated chloride channel that is also sensitive to the anti-parasitic drug ivermectin, a derivative of avermectin. Although less is known about this unique class of glutamate-gated channels compared to the cationic iGluRs, genetic and electrophysiological analyses have provided some insight into their role in worm behavior (Yates et al., 2003). The cellular distribution of a subset of C. elegans GluCl subunits has been described using the reporter molecule GFP. 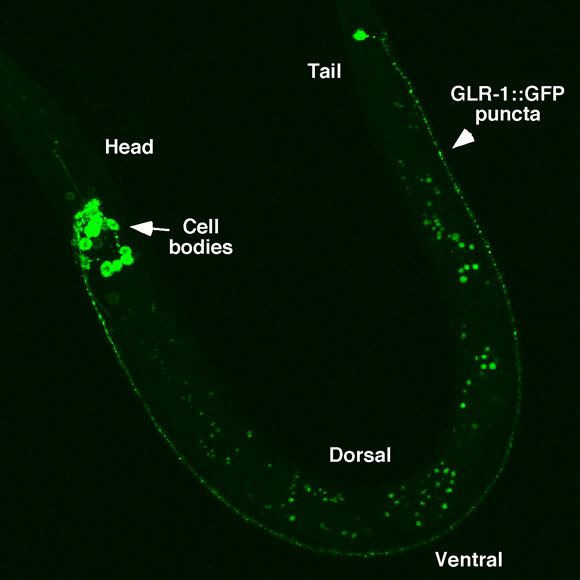 GluCls are expressed in both pharyngeal muscle cells and neurons providing insight into the possible roles of GluCls in worm behavior. avr-14 (GluClα3) is exclusively expressed in the extrapharyngeal nervous system, including motor neurons and the mechanosensory neurons ALM, PLM and PVD (Dent et al., 2000). avr-15 (GluClα2) is expressed in the extrapharyngeal nervous system and the pm4 (metacorpus) and pm5 (isthmus) pharyngeal muscle cells (Dent et al., 1997). Unlike avr-14 and avr-15, which are widely expressed, glc-2 (GluClβ) expression is limited to the pm4 muscle cells (Laughton et al., 1997b) where it is likely to form functional heteromeric channels with AVR-15/GluClα2 (Vassilatis et al., 1997). As the distribution of GluCl subunits suggests, GluCls are involved in pharyngeal pumping, sensory perception and locomotion. The AVR-15/GluClα2 subunit functions to inhibit pharyngeal muscle contractions during pharyngeal pumping (Dent et al., 1997; Pemberton et al., 2001). The glutamatergic M3 motor neurons primarily synapse onto the pm4 muscle cells (Albertson and Thomson, 1976) and regulate the timing of muscle relaxation during pharyngeal pumping (Avery, 1993). The M3s generate inhibitory post synaptic potentials (IPSPs) in contracted pharyngeal muscle, which result in muscle relaxation (Avery, 1993; Raizen and Avery, 1994). Mutations in avr-15 eliminate M3 mediated IPSPs (Dent et al., 1997). Interestingly, intracellular recordings from pharyngeal muscle cells revealed that exogenously applied glutamate elicits a chloride-dependent depolarizing current that is dependent on avr-15 (Pemberton et al., 2001). In the extrapharyngeal nervous system, the α-type subunits, AVR-14/GluClα3, AVR-15/GluClα2 and GLC-1/GluClα1, are responsible for sensitivity to ivermectin (Dent et al., 2000). In addition to inhibiting pharyngeal pumping, ivermectin reduces mobility due to paralysis of the mid-body region. GluCl channels might also function in opposition to the excitatory iGluR subunits GLR-1, GLR-2 and NMR-1 in the command interneurons to drive forward rather than backward movement. A small glutamate-gated chloride current is evident in the AVA command interneurons in the absence of GLR-1/GLR-2 and NMR-1 mediated cationic currents (Mellem et al., 2002); however, the GluCl subunits responsible for this current have not been identified. Conversely, mutations in avr-15 dramatically reduce the response to anterior body touch in worms in which the AVD command interneurons have been laser ablated (Lee et al., 1999), suggesting that AVR-15/GluClα2 might also function to inhibit forward movement in response to mechanical stimuli. Interestingly, mechanical stimulation of the tail slows the rate of pharyngeal pumping in adult worms; and mutations in both avr-14 and avr-15 reduce these inhibitory effects (Keane and Avery, 2003). This suggests a flow of information from the extrapharyngeal nervous system to the pharynx. This idea is supported by the observation that ivermectin inhibits pharyngeal pumping in avr-15 mutants; however, pumping resumes when the pharynx is dissected out (Dent et al., 2000). By expressing GFP-tagged iGluRs in transgenic worms, we now have a detailed map of the neurons that express iGluRs (Hart et al., 1995; Maricq et al., 1995; Brockie et al., 2001a). Given the caveats associated with GFP expression, we know which iGluR subunits are expressed in any given neuron. Six of the subunits, including 4 non-NMDA (glr-1, glr-2, glr-4 and glr-5) and 2 NMDA (nmr-1 and nmr-2), are expressed in many of the command interneurons - AVA, AVB, AVD, AVE and PVC - which control forward and backward movement (Figure 2). The distribution of NMDA receptors is almost exclusive to these interneurons. Both glr-3 and glr-6 are expressed in a single interneuron pair, the RIA neurons (Figure 3A-C). Laser ablation studies have placed RIA in the neural circuit that controls thermotaxis (Mori and Ohshima, 1995). The remaining subunits, glr-7 and glr-8, are expressed in partially overlapping sets of neurons in the pharyngeal nervous system (Figure 3D-I). The distribution of iGluR subunits suggests that iGluRs might be involved in behaviors as diverse as the avoidance of noxious stimuli to the control of pharyngeal activity. To address these possibilities, mutations in a number of the genes encoding iGluR subunits have been generated. Figure 2. Four non-NMDA and two NMDA iGluR subunits are expressed in the command interneurons. (Left) Confocal images of transgenic worms (head and tail region only) that expressed GFP fusions to the non-NMDA subunits glr-1, glr-2, glr-4 and glr-5, and the NMDA subunits nmr-1 and nmr-2. (Right) A schematic representation of the neuronal cell bodies in the head and tail. Filled cells (gray and black) represent neurons that express the respective subunit. (Bottom) Neurons that express at least one of the six subunits are labeled. Cells filled in black represent the command interneurons (right and bottom). This figure was reproduced with permission from Brockie et al. (2001a). Copyright © 2001 Society for Neuroscience. Figure 3. 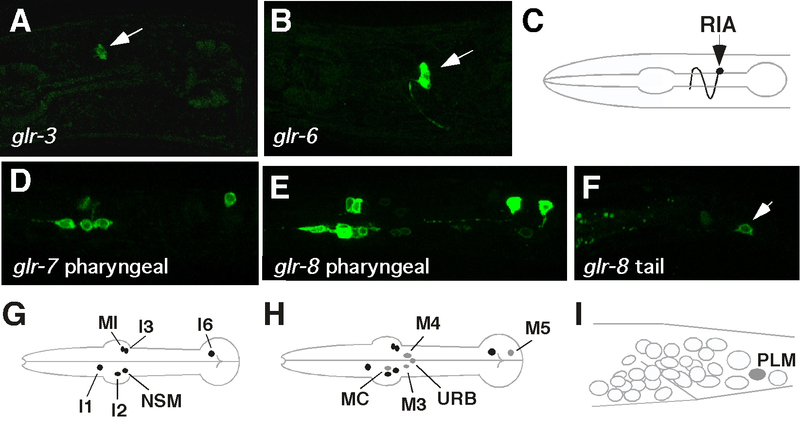 IGluR subunits expressed in the RIA interneurons (glr-3 and glr-6) and the pharyngeal nervous system (glr-7 and glr-8). Confocal image of a transgenic worm (head region only) that expressed either glr-3::GFP (A) or glr-6::GFP (B). (C) Schematic diagram of RIAL cell body and process. Confocal image of a transgenic worm that expressed either glr-7::GFP (D) or glr-8::GFP (E) in the pharyngeal nervous system. glr-8::GFP is also expressed in the PLM neurons (F). (G, H and I) Schematic diagram of neuronal cell bodies in the pharynx (G and H) and tail (I) that express either glr-8 (gray) or glr-7 and glr-8 (black). This figure was reproduced with permission from Brockie et al. (2001a). Copyright © 2001 Society for Neuroscience. Until recently, a comprehensive approach to the study of the C. elegans nervous system had not been possible due to a lack of electrophysiological techniques to directly study synaptic function. Analysis of synaptic function was facilitated by the "slit worm" preparation first described by Lockery and Goodman (Lockery and Goodman, 1998). Over the past 5 years, the technique has been applied to the study of muscle cells (Richmond and Jorgensen, 1999), and extended to the characterization of glutamate-gated currents in identified neurons, including AVA and AVD (Brockie et al., 2001b; Mellem et al., 2002; Zheng et al., 2004). In vivo patch-clamp recordings from these neurons reveal robust NMDA and non-NMDA dependent glutamate-gated currents. The AVA interneurons are a central component of the withdrawal response to noxious stimuli. The glutamate-gated current in AVA can be divided into two major components, a large and rapid current component that is dependent on the GLR-1 and GLR-2 non-NMDA subunits (Mellem et al., 2002), and a smaller yet longer-lasting current. The fast, GLR-1-dependent current mediates the backing response to nose touch and hyperosmotic stimuli (see “The Role of iGluRs in Worm Behavior”). The slower current is activated by the agonist NMDA and is abolished by a deletion mutation in the NMR-1 subunit (Brockie et al., 2001b). The kinetic properties of the non-NMDA and NMDA channels are consistent with iGluR currents observed in vertebrate systems. Interestingly, while mutations in glr-1 appear to completely eliminate the fast glutamate-gated current, in glr-2 mutants, a small yet rapid current is still present, indicating that GLR-1 might form a homomeric receptor or heteromeric receptors with other iGluR subunits (Mellem et al., 2002). The different electrophysiological properties of the AVA neurons in glr-1 and glr-2 mutants parallel the subtle differences in behavior, demonstrating that receptor function can be correlated with neuron excitability and worm behavior. NMDA-gated currents recorded from AVA exhibit the voltage dependence that is characteristic of NMDA receptor mediated currents (Brockie et al., 2001b). The slow kinetics of the NMDA receptor may provide a temporal window during which small currents resulting from multiple, independent sensory inputs are summated to generate a membrane depolarization sufficient to initiate backward movement. The absence of these long-lasting currents appears to be responsible for the reduced frequency of backward movements observed in nmr-1 mutants (Brockie et al., 2001b). These results demonstrate the advantage of combining genetic, molecular, behavioral and electrophysiological analyses of nervous system function. Electrophysiological analysis of C. elegans neuronal function is still in its infancy. Although it is now straightforward to record ligand-gated and voltage-gated currents from identified neurons, it is much more difficult to study nerve-evoked currents in neurons or endogenous, spontaneous synaptic activity. Two technical hurdles prevent more rapid progress. First, electrical, mechanical or optical techniques need to be developed to selectively activate neural inputs to identified neurons. Some progress has been made. Recently, the receptor potential in touch neurons was analyzed using electrophysiological techniques. Worms avoid mechanical stimulation but habituate to repeated taps. However, the receptor potential in sensory neurons showed no evidence of decay indicating that habituation probably does not occur at the level of the sensory neurons (O'Hagan et al., 2005). Continued development of new stimulation techniques and their application to interneurons and motor neurons bodes well for a mechanistic understanding of the C. elegans nervous system. The second major hurdle is the lack of a well-developed pharmacology. Specific drugs — agonists and antagonists — are required to acutely perturb synaptic function. These drugs are slowly being developed and a combination of genetics and pharmacology has led to major advances in our understanding of the neuromuscular junction (Richmond and Jorgensen, 1999; Francis et al., 2005). The first iGluR subunit to be characterized in the worm was the AMPA-subtype encoded by glr-1. Mutations in glr-1 disrupt the backing response to nose touch stimulation (Hart et al., 1995; Maricq et al., 1995). This defect is a result of faulty glutamatergic neurotransmission between sensory neurons (primarily the ASH polymodal sensory neurons) and the command interneurons that express GLR-1 (Mellem et al., 2002). Since the initial characterization of glr-1 mutants, additional behavioral paradigms were developed, which now link GLR-1 to the avoidance of hyperosmotic stimuli (Mellem et al., 2002) and the volatile repellent octanol (Hart et al., 1999; Chao et al., 2004), the "spontaneous" switch from forward to backward movement (Zheng et al., 1999; Brockie et al., 2001b), foraging behavior (Hills et al., 2004) and long-term memory (Rose et al., 2003; Table 1). Phenotype of glr-1, glr-2 and nmr-1 mutants. + indicates the response to nose touch (Not) or osmotic stimuli (Osm) compared to wild-type where ++++ represents wild-type behavior. ND, not determined. The GLR-2 subunit is expressed in many of the neurons that express GLR-1, including the command interneurons. glr-1 and glr-2 mutants share the same behavior defects, although some are less severe in glr-2 mutants (Mellem et al., 2002). Interestingly, glr-2 transcription, but not glr-1, is induced in response to ethanol exposure (Kwon et al., 2004); however the behavior of glr-1 and glr-2 mutants in response to ethanol has not been characterized. The small differences in mutant behaviors are paralleled in the electrophysiological profiles of each mutant (see “Electrophysiological Analysis of iGluRs in C. elegans”). Together, the electrophysiological and behavioral data suggest that GLR-1 and GLR-2 form functional heteromeric ligand-gated channels required for the avoidance of noxious stimuli. The mechanisms that regulate avoidance behaviors associated with GLR-1/GLR-2 channels were further elucidated by an analysis of nmr-1 mutants. nmr-1 and nmr-2 are co-expressed in a small subset of neurons, including a majority of the command interneurons (Brockie et al., 2001a). nmr-1 mutants are normal for the nose touch response (Brockie et al., 2001b); however, a subtle defect in osmotic avoidance was revealed (Mellem et al., 2002) using a technique first described by Hilliard, et al. (Hilliard et al., 2002). The requirement for nmr-1 in osmotic avoidance and not the nose touch response might be due to differential release of glutamate from the ASH neurons dependent on the sensory modality. This hypothesis was supported by characterizing the role of egl-3 in both nose touch and osmotic avoidance (Kass et al., 2001; Mellem et al., 2002). egl-3 encodes an orthologue of the PC2 family of proprotein convertases that process proneuropeptides into active signaling molecules (Kass et al., 2001). Genetic and electrophysiological analyses are consistent with the idea that EGL-3 normally downregulates glutamate release; however, proof of this hypothesis will require more direct measures of glutamate release in these mutants (Mellem et al., 2002). In one model, glutamate release due to nose touch stimulation is upregulated in egl-3; glr-1 double mutants thus activating NMDA receptors and partially compensating for the loss of GLR-1. NMDA receptors might also participate in the response to hyperosmotic stimuli, but not nose touch stimuli, due to increased glutamate release compared to that induced by tactile stimulation, although this hypothesis has not been directly tested. In this model, the polymodal ASH sensory neurons might decode tactile and hyperosmotic sensory modalities by differential release of glutamate, which in turn leads to differential activation of non-NMDA and NMDA receptors. In vertebrates, non-NMDA and NMDA receptors appear to be differentially distributed at a subset of glutamatergic synapses with NMDA receptors located at extrasynaptic sites (Chen and Diamond, 2002). A similar distribution of receptors might also exist in C. elegans as GLR-1 and NMR-1 subunits do not appear to co-localize at synapses along the ventral cord (Brockie et al., 2001b). In addition to their role in avoidance behaviors, NMDA receptors in C. elegans are also required for sensitivity to the anesthetic nitrous oxide (N2O) otherwise known as laughing gas (Nagele et al., 2004). nmr-1 mutants are resistant to the effects of N2O, whereas glr-1 mutants are not. Furthermore, nmr-1 mutants have similar behavioral defects as wild-type worms exposed to N2O suggesting that N2O disrupts NMDA receptor function. Thus, NMDA receptors are hypothesized to be the major molecular target of N2O. This study shed light on the mechanism of action of N2O and showed that its mechanism of action was distinct from that of volatile anesthetics; the most commonly used general anesthetics. In vertebrates, iGluRs play an important role in synaptic plasticity - the cellular mechanism thought to underlie learning and memory formation (Malenka and Bear, 2004). Although it has proved difficult to assess learning and memory in the worm, there are a number of behavioral paradigms used to characterize these behaviors. A relatively simple learning protocol that tests the habituation response to tap vibrations has linked the EAT-4 vesicular glutamate transporter and the GLR-1 subunit to habituation behavior (Rose et al., 2002; Rose et al., 2003). Furthermore, in certain paradigms worms can learn to associate paired stimuli and this association is dependent on glr-1 (Morrison and van der Kooy, 2001). The subcellular localization of iGluRs can be characterized using functional fusion proteins between iGluRs and GFP (Rongo et al., 1998; Brockie et al., 2001b; Mellem et al., 2002). These iGluR::GFP chimeras are distributed in a punctate pattern along the neural processes of transgenic worms. The puncta align with presynaptic markers and are likely to represent postsynaptic sites (Rongo et al., 1998). Functional GLR-1::GFP proteins have proven an extremely valuable reagent for assessing the trafficking, membrane insertion and stabilization of GLR-1 containing receptors (Figure 4). GLR-1::GFP was first used to describe the role of the LIN-10 PDZ-domain protein in GLR-1 localization (Rongo et al., 1998). In vertebrates, PDZ-domain proteins interact with select NMDA and non-NMDA subunits and are proposed to be required for the proper localization and stabilization of iGluRs at the postsynaptic density (Sheng and Sala, 2001; Bredt and Nicoll, 2003; Kim and Sheng, 2004). Mutations in lin-10 change the punctate distribution of GLR-1::GFP to one that appears more uniformly distributed. Like glr-1 mutants, lin-10 mutants are nose touch defective lending further support to the hypothesis that LIN-10 is required for the synaptic localization of GLR-1 subunits (Rongo et al., 1998). Interestingly, the vertebrate homologue, mLin-10, has also been implicated in the regulation of AMPA receptor trafficking and surface expression (Stricker and Huganir, 2003). During development, the density of GLR-1::GFP puncta along the ventral cord remains the same even though the length of the worm increases approximate 10-fold. unc-43, which encodes calcium and calmodulin-dependent protein kinase II (CaMKII), has an important role in maintaining the density of receptors at synapses (Rongo and Kaplan, 1999). An unc-43 loss-of-function mutation disrupts trafficking leading to an accumulation of GLR-1::GFP in cell bodies and a reduction in the density of GLR-1 synapses. Paradoxically, an unc-43 gain-of-function mutation, that renders UNC-43 constitutively active, also reduces the number of GLR-1 synapses; however, the mutation does not affect receptor trafficking. Interestingly, the constitutively active form of UNC-43 fails to localize to synaptic clusters in the ventral cord. Together, these findings suggested that UNC-43 activity during development is required to traffick GLR-1 from the cell body for the formation of new synapses. Once the appropriate synaptic density has been established, UNC-43 might function at synapses to maintain GLR-1 density (Rongo and Kaplan, 1999). Figure 4. GLR-1::GFP is expressed in a punctate pattern along processes of the ventral cord. A confocal image of a transgenic worm that expressed a functional GLR-1::GFP chimera (Rongo et al., 1998). GLR-1::GFP is expressed in cell bodies (arrow) and in punctate structures in the ventral cord processes (arrowhead) thought to represent postsynaptic sites. What other molecules are required to traffick iGluR subunits from the cell body to the appropriate postsynaptic sites? Recently, the unfolded protein response (UPR) has been implicated in the export of C. elegans iGluR subunits from the endoplasmic reticulum (ER) (Shim et al., 2004). Various stress factors can lead to the accumulation of improperly folded proteins in the ER, and the UPR is a mechanism used by eukaryotic cells to cope with this accumulation of protein (Rutkowski and Kaufman, 2004; Zhang and Kaufman, 2004). Activation of the UPR results in the overall attenuation of protein translation with the exception of increased synthesis of targeted proteins such as ER chaperones. Homologues of key proteins of the vertebrate UPR, IRE1 and XBP1, are found in C. elegans. Interestingly, mutations in ire-1 and xbp-1 prevent GLR-1 export from the ER even in the absence of ER stress (Shim et al., 2004). The GLR-2 and GLR-5 iGluR subunits also accumulate in the ER of ire-1 and xbp-1 mutants suggesting that the UPR is a critical component of the trafficking pathway that ultimately leads to the formation of functional glutamatergic synapses. These findings were supported by recent studies of the GluR1 vertebrate AMPA subunit (Vandenberghe et al., 2005). GluR1 is poorly expressed on the surface of transfected COS7 cells and instead accumulates in the ER. Upregulation of the UPR boosts surface expression in transfected cells. These effects are also seen when GluR1 is co-expressed with the transmembrane protein stargazin, the founding member of the transmembrane regulators of AMPA receptor function (TARP) family (Tomita et al., 2003). In addition to its role in AMPA receptor trafficking, stargazin also appears to regulate the levels of functional receptors at both the plasma membrane and at synapses (Chen et al., 2000; Bredt and Nicoll, 2003). In addition to the UPR, GLR-1 exit from the ER is regulated by a quality control mechanism that prevents defective receptors from reaching the synapse. Thus, mutations in GLR-1 that are predicted to disrupt glutamate-binding or modify ion permeability increase retention of GLR-1 in the ER (Grunwald and Kaplan, 2003). Similarly, mutations in the vertebrate GluR6 kainate subunit that dramatically reduce ligand-binding also result in ER retention of the receptor (Mah et al., 2005). Interestingly, the mutated subunits can still form multimeric complexes suggesting that ER retention is not due to gross errors in protein folding. The Q/R site, located in the pore region of the vertebrate GluR2 subunit, also acts as an ER retention signal (Greger et al., 2002). A subset of vertebrate AMPA subunits undergo a process of RNA editing, which substitutes a glutamine (Q) codon for arginine (R) in the pore region (Sommer et al., 1991; Seeburg et al., 1998). Editing is most apparent in vertebrate GluR2 and receptors that contain the edited R form show a decrease in Ca2+ permeability and a change in channel rectification compared to those that contain the unedited Q form (Burnashev et al., 1992a). The majority of edited GluR2(R) subunits do not form tetrameric complexes and are therefore retained in the ER whereas the unedited GluR2(Q) subunits tetramerize, exit the ER and localize to synapses (Greger et al., 2003). Retaining GluR2(R) in the ER therefore controls the abundance of Ca2+ permeant AMPA receptors at the synapse, thus regulating synaptic strength. The C. elegans glr-2 genomic sequence encodes glutamine at the Q/R site (Brockie et al., 2001a; Mellem et al., 2002). When R is substituted for Q, transgenic worms that express the modified GLR-2(R) subunit exhibit, at low penetrance, uncoordination, neuronal degeneration, developmental arrest, and lethality (Aronoff et al., 2004) - phenotypes that are not caused by a glr-2 deletion mutation alone (Mellem et al., 2002). Synaptic AMPA iGluRs are not static, but rapidly cycle between a subcellular pool and the postsynaptic membrane. This dynamic process is of central importance for synaptic plasticity (Malinow and Malenka, 2002; McGee and Bredt, 2003; Contractor and Heinemann, 2004). Agonist-induced endocytosis of vertebrate AMPA receptors has been linked to the ubiquitin-proteasome pathway (Colledge et al., 2003; Patrick et al., 2003). In C. elegans, iGluR ubiquitination together with clathrin-mediated endocytosis regulate the levels of synaptic iGluRs (Burbea et al., 2002). unc-11 encodes an orthologue of the AP180 clathrin adaptin protein, mutations in which cause endocytotic defects (Nonet et al., 1999). UNC-11 is required for clathrin-mediated endocytosis of GLR-1 containing receptors as mutations in unc-11 increase the levels of GLR-1::GFP at ventral cord puncta. GLR-1::GFP also accumulates when ubiquitination of GLR-1 is blocked, thus ubiquitination leads to clathrin-mediated endocytosis of GLR-1 via an UNC-11 dependent mechanism (Burbea et al., 2002). The anaphase-promoting complex (APC) also regulates the abundance of iGluRs at both Drosophila (van Roessel et al., 2004) and C. elegans (Juo and Kaplan, 2004) synapses. The APC is a multisubunit ubiquitin ligase that assembles ubiquitin chains on substrate molecules thereby regulating their degradation (Harper et al., 2002; Peters, 2002). In C. elegans, mutations in mat-1, mat-2, mat-3, emb-30 and emb-27, which encode subunits of the APC (Furuta et al., 2000; Golden et al., 2000; Wallenfang and Seydoux, 2000; Davis et al., 2002), result in an accumulation of GLR-1::GFP at ventral cord puncta (Juo and Kaplan, 2004). Furthermore, GLR-1::GFP puncta size is also increased in transgenic worms that overexpress the amino terminal of the APC subunit CDH1, which acts as a dominant negative. Interestingly, GLR-1 does not appear to be a direct target of the APC as mutations in GLR-1 that block ubiquitination further increase GLR-1::GFP puncta size in emb-27 mutants. Instead, the APC might target scaffold proteins that associate with GLR-1. The accumulation of synaptic GLR-1::GFP that is associated with a decrease in APC activity results in a predicted change in worm behavior. Thus, mat-1 mutants (Juo and Kaplan, 2004) have locomotion defects similar to glr-1 gain-of-function mutants (Zheng et al., 1999; Juo and Kaplan, 2004). The data suggest that both ubiquitination of GLR-1 and the APC modulate the strength of glutamatergic signaling thus maintaining plasticity of the nervous system. Homeostatic regulation of iGluR abundance at synapses, termed synaptic scaling, is a proposed compensatory mechanism by which neurons maintain a normal level of synaptic input (Turrigiano and Nelson, 2004). Manipulations that chronically suppress synaptic transmission increase AMPA receptor abundance at synapses, whereas those that enhance activity decrease their synaptic abundance. In C. elegans a mutation in either unc-2, which encodes a voltage-dependent calcium channel, or eat-4, which encodes a vesicular glutamate transporter, are predicted to suppress activity at glutamatergic synapses. Both unc-2 and eat-4 mutants display an increased abundance of GLR-1::GFP at ventral cord puncta that parallels an increase in the amplitude of glutamate-gated currents in response to exogenously applied glutamate (Grunwald et al., 2004). 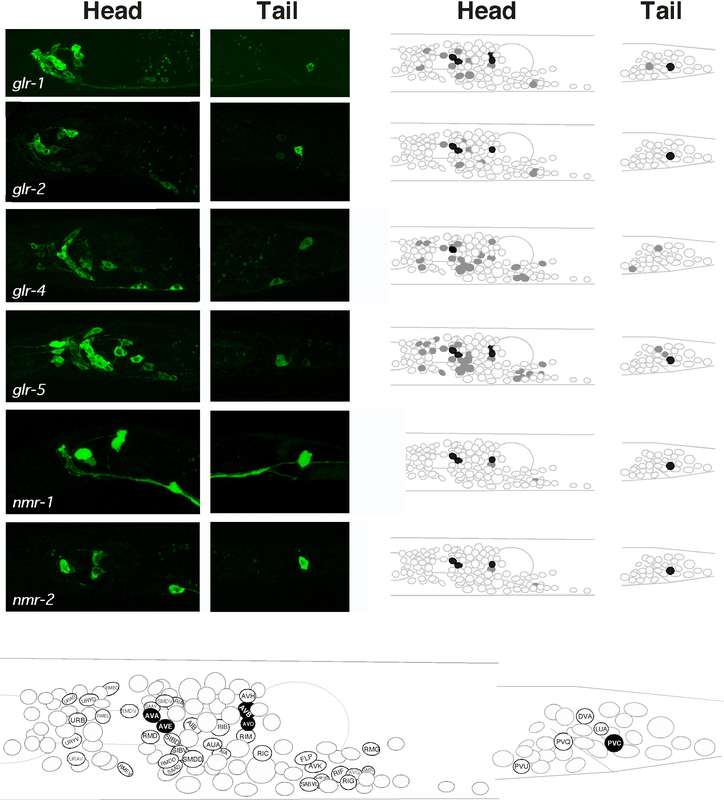 The abundance of GLR-1::GFP at synapses of unc-11; eat-4 double mutants is not further increased, suggesting that synaptic scaling in C. elegans depends on clathrin-mediated endocytosis. Once localized to the appropriate postsynaptic sites iGluRs must be competent to gate open in response to ligand binding. Are additional gene products required for iGluR synaptic function? The SOL-1 CUB-domain transmembrane protein was identified in a genetic screen for modifiers of a constitutively active variant of GLR-1 (Zheng et al., 2004). SOL-1 is required for GLR-1 dependent glutamate-gated currents, and for behaviors that are dependent on GLR-1 mediated synaptic transmission. Formally, the loss of glutamate-gated currents in sol-1 mutants can be explained by loss of membrane iGluRs, loss of ligand binding, loss of ligand-dependent gating, or altered desensitization. Although the data suggest that SOL-1 affects the properties of GLR-1 receptor gating or desensitization, the mechanism of SOL-1 function still remains to be determined. Nonetheless, the identification of this novel protein in C. elegans shows that iGluRs are not simply stand-alone molecules and suggests that glutamatergic signaling in other organisms may be similarly dependent on SOL-1-like accessory subunits. The analysis of iGluRs in C. elegans has progressed rapidly in the past decade. Genetic and electrophysiological studies have provided new insights into how iGluRs contribute to animal behavior and demonstrated that the molecular, pharmacological and electrophysiological properties of iGluRs in C. elegans parallel those of vertebrate receptors. This implies that what we learn from the worm will lead to a better understanding of this receptor family in more complex vertebrate systems. Although our knowledge of iGluR signaling has advanced considerably since the first subunit was cloned in 1989 (Hollmann et al., 1989), many outstanding questions still remain. Current efforts are largely focused on understanding the molecular mechanisms that assemble functional glutamatergic synapses, the regulation of synaptic plasticity, and how plasticity contributes to behavior. Although these questions can be addressed in vertebrate systems, the studies can be difficult due to the immense complexity of the nervous system. An obvious advantage of C. elegans is the relative ease of identifying and cloning new and novel genes required for glutamatergic signaling, such as sol-1 and components of the UPR and APC (see “Mechanisms of iGluR Localization, Stabilization and Function at the Synapse”). Identifying new molecules can challenge and refine prevailing models of iGluR mediated synaptic signaling. To this end, ongoing genetic studies in C. elegans are expected to make important contributions to the understanding of this important class of neurotransmitter receptors. We thank The Society for Neuroscience for permission to reproduce Figures 1, 2, and 3, and members of the Maricq laboratory for their cited research. A.V.M. is supported by grants from the National Institutes of Health, and the National Science Foundation, and is an independent investigator of the National Alliance for Research on Schizophrenia and Depression. Francis, M.M., Evans, S.P., Jensen, M., Madsen, D.M., Mancusco, J., Norman, K., and Maricq, A.V. (2005). The Ror receptor tyrosine kinase CAM-1 is required for ACR-16 mediated synaptic transmission at the C. elegans neuromuscular junction. Neuron 46, 581–594. Lee, R.Y., Sawin, E.R., Chalfie, M., Horvitz, H.R., and Avery, L. (1999). EAT-4, a homolog of a mammalian sodium-dependent inorganic phosphate cotransporter, is necessary for glutamatergic neurotransmission in Caenorhabditis elegans. J. Neurosci. 19, 159–167. *Edited by Erik M. Jorgensen and Joshua M. Kaplan. Last revised April 23, 2005. Published January 19, 2006. This chapter should be cited as: Brockie, P. J. and Maricq, A. V. Ionotropic glutamate receptors: genetics, behavior and electrophysiology (January 19, 2006), WormBook, ed. The C. elegans Research Community, WormBook, doi/10.1895/wormbook.1.61.1, http://www.wormbook.org. Copyright: © 2006 Penelope J. Brockie and Andres V. Maricq. This is an open-access article distributed under the terms of the Creative Commons Attribution License, which permits unrestricted use, distribution, and reproduction in any medium, provided the original author and source are credited.